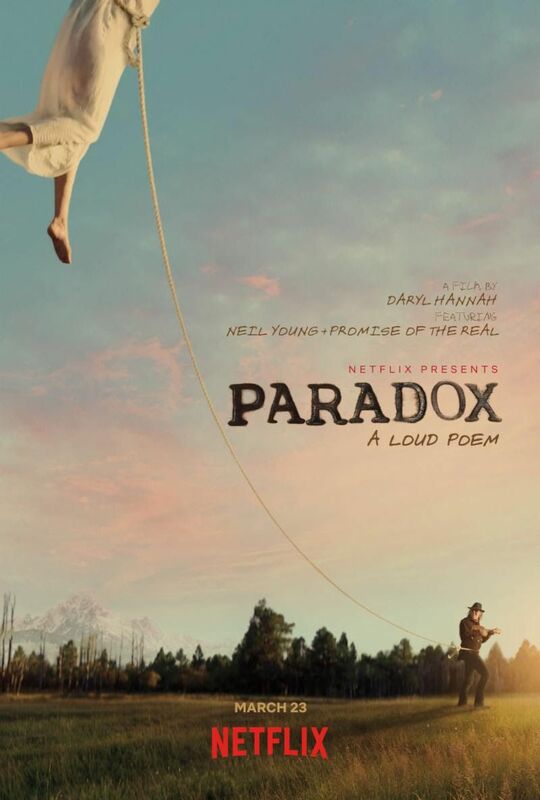 Netflix announced today they have acquired worldwide rights to the film Paradox, written and directed by Daryl Hannah and featuring new music and performances from Neil Young + Promise of the Real, which will debut at the 2018 SXSW Film Festival, as announced in February, before launching globally on Netflix on March 23, when it will also receive a limited theatrical release. A fantasy, a loud poem and a free-spirited tale of music and love, Paradox is a one-of-a-kind personal expression. Sometime in the future—or is it the past?—a band of outlaws hide high up in the Mountains. The “Man in the Black Hat” (Neil Young), the “Particle Kid” (Micah Nelson) and “Jail Time” (Lukas Nelson) pass the hours searching for treasure while they wait for the full moon to lend its magic, bring the music and make the spirits fly. Vibrating with original music by Young + Promise of the Real, Paradox furthers the legacy of an iconic performer who has always broken the rules. Paradox is writer-director Hannah’s feature-length debut behind the camera—she’s appeared in front of the camera many times, with iconic roles in the Kill Bill films, 1987’s Wall Street and 1984’s Splash, among others. Hannah’s 1993 short The Last Supper, which she wrote, directed and produced, won a Jury Prize at the Berlin Film Festival. Hannah’s film stars Young, Lukas Nelson, Micah Nelson, Willie Nelson, Corey McCormick, Anthony LoGerfo, Tato Melgar, Charris Ford and Dulcie Clarkson Ford. Paradox is produced by Bernard Shakey and Elliott Rabinowitz, edited by Paul Snyder and photographed by Adam CK Vollick. Paradox (Original Music from the Film) is due out on March 23 as well, to be released on digital and vinyl via Reprise/Warner Bros. Records. The soundtrack features studio and live performances from Neil Young + Promise of the Real, as well as classic covers and music composed exclusively for the film. Again, Paradox comes to Netflix on March 23. This entry was posted on Thursday, March 8th, 2018 at 8:57 am and is filed under Lukas Nelson, Micah Nelson, Movies, Videos, DVDs, Neil Young. You can follow any responses to this entry through the RSS 2.0 feed. You can leave a response, or trackback from your own site.